A number of private sector organizations are expected to support the advocacies of Vice President-elect Leni Robredo, according to her spokesperson Georgina Hernandez. Hernandez revealed that this early, private sector groups are reaching out to Robredo, signifying their intentions to provide assistance, especially in her anti-poverty programs. The private sector can always harness its resources and put these to good use if they choose to do so. By extending much-needed help to noteworthy projects, private organizations can give back to the community as well as become a major force in the upliftment of the marginalized sectors of society. Hernandez cited the recent project of the Energy Development Corporation (EDC) as a prime example of how private corporations can align their projects with those of the government. 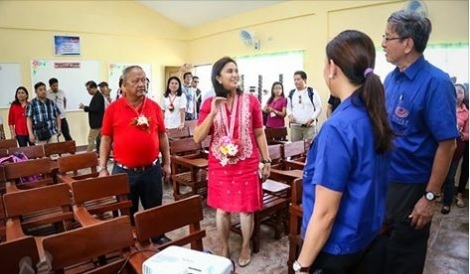 Incoming VP Robredo recently inaugurated the post-Yolanda rehabilitation program of EDC, which showcased the 150 schoolhouses built by the company at the Margen National High School in Ormoc, Leyte. We are of the belief that getting through the challenge of natural disasters takes more than just actions from the government, but a partnership between the government and the people. Robredo had not been given any cabinet post by president-elect Duterte because of his friendship and alliance with losing VP candidate Sen. Bongbong Marcos. With or without the cabinet post, however, Hernandez assures that Robredo will pursue her advocacies and will fulfill her campaign promises on poverty alleviation. Incoming VP Robredo will inherit a sizable chunk of the P500 million 2016 budget from her predecessor VP Jejomar Binay, who said his office spent only P78 million so far and will probably spend another P10 million until the end of June. In the hands of a corrupt politician, P400 to P500 million yearly may just be a drop in the bucket. But in the hands of an honest public servant, which most people think Robredo is, half a billion pesos can go a long, long way.